Jersey's most exciting adventure activity ! Purchase instantly online with a credit or debit card. Your voucher will be emailed to you directly, for you to print off. Modern design, personalised with your choice of To and From name fields. As an individual, or part of a group, many people skydive to raise money for charity. Visit our documents section for an info sheet, or contact us to find out more about charity skydiving. Everyone should do this at least once in their lifetime, and that includes you ! Wether to fulfil a lifelong ambition, overcome a fear, or just because….. whatever the reason, you can skydive in Jersey with us ! Of course I was nervous and several times I asked myself why was I putting myself through it! But it was incredible and I am so pleased I did it. Mally and the team are amazing. Safety is first and foremost but there is also loads of fun and excitement. What a fantastic experience from start to end, - the training was through and the team put us all at ease. The weather for our jump was clear and still which made for unbelievable views of the islands. A video option was offered which I took up - the video was professionally put together and ..
We can record the whole event to make a 10 minute HD movie, of your experience. Supplied on a USB or DVD. Your link, you share your video on social media, or with friends and family. Digital still photos compliment your video, for your screen savers or photo albums. Book Now Most Popular ! What are you waiting for ? Let's do this ! If you still need a little persuasion or further information, then don't hesitate to ask. We would love you to skydive with us this year, and will answer any questions you have. Please review our client reviews below ! There is a maximum weight limit for your safety of 95Kg, 210Lbs or 15 stones. This is for your safety, and the limitations of the equipment. The minimum age is 16 years old (with parental consent.) There is no upper age limit, subject to fitness. You are required to complete either a Medical self declaration (Form 115A), or provide a doctors certificate (Form 115B). These can be found on our downloads page. Please consult the notes within the form. The total cost of a Tandem skydive is £330. To make a booking, a deposit payment of £130 is required. The remaining balance is due on the day. The optional Video package cost is an additional £130. There is no option for photos only. Skydive Jersey updated their cover photo. The Temperature in Jersey this morning at 08:45 is 8.1˚C and the average wind speed is 24.4 mph. Have a great day ! The Temperature in Jersey this morning at 08:45 is 10.4˚C and the average wind speed is 36.0 mph. Have a great day ! The Temperature in Jersey this morning at 08:45 is 11.1˚C and the average wind speed is 15.0 mph. Have a great day ! 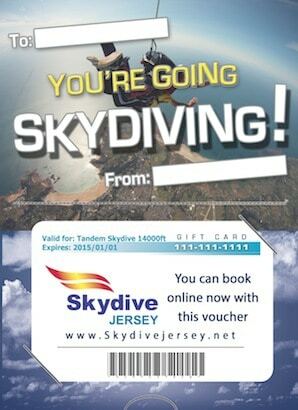 Customise voucher with name & message. Valid for 12 months, book online later.